Greetings and Welcome to a New Year! 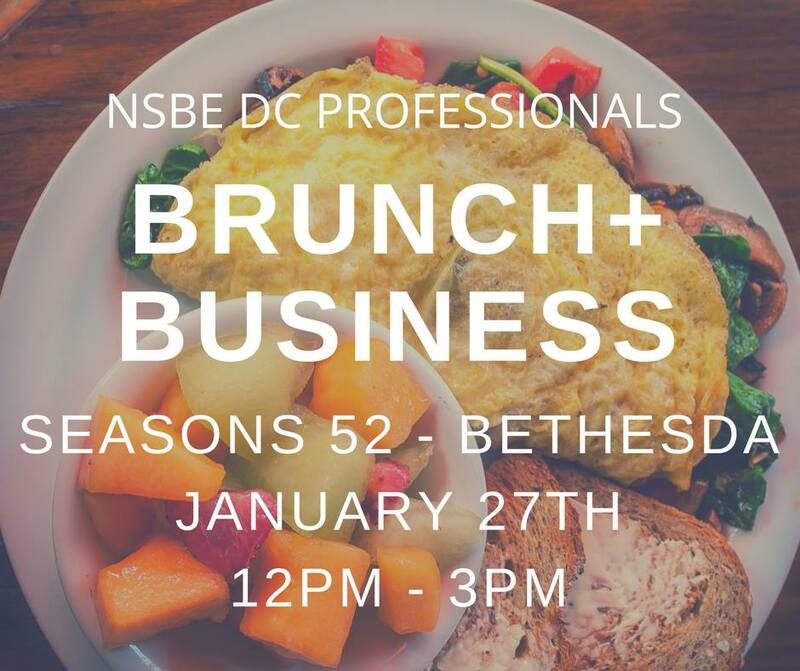 Come learn what the chapter has planned for 2018 at our inaugural Brunch and Business, taking place at the Seasons 52 Fresh Grill in North Bethesda, MD from 12 - 3 pm. We will have a private room at the restaurant (complementary Wi-Fi as well! ), where we will discuss our budget for the year, the current financial status of the chapter, and have committee chairs discuss their planned programming for the year and how you can get involved. Attendees will be responsible for covering their meals, but the chapter will cover dessert! The flavors offered will be Belgian Chocolate Smore, Chocolate Peanut Butter Torte, Mocha Macchiatto, Pecan Pie, Key Lime Pie with a Pecan Crust, Raspberry Chocolate Chip Cannoli, and Carrot Cake. The deadline to RSVP is January 25 at 11 pm (the restaurant will need a count so they can prepare accordingly) and registration is capped at 50 people so please do so as soon as possible! NSBE DC Members, feel free to invite a guest who you think would be benefit from being involved in the chapter! You can check out the restaurant's brunch menu at http://www.seasons52.com/menu-listing/brunch. NOTE: IF YOU REGISTER AND REALIZE YOU CANNOT ATTEND ANYMORE, PLEASE REMEMBER TO CANCEL! We want to ensure that in the case of a waitlist, that everyone will get an opportunity to attend. Parking: There are multiple parking options: (1) The restaurant offers complementary valet parking for 2 hours; (2) You can park on the streets around the restaurant (cost is $1.00/hour); (3) The White Flint Metro Station (Red Line) is a 6 minute walk from the restaurant and parking is free at the station; (4) You can park in the Whole Foods garage in sections P2 and P3 for free for 2 hours. Metro: The White Flint Station (Red Line) is a 6 minute walk from the restaurant.